Working on a finishing line can mean many different things dependent on the industry. An aluminium finishing line will usually have the objective of reducing the ‘off-flatness’ of the strip in order to meet customer requirements. The removing of off-flatness, which could be in the form of centre buckle or wavy edge caused by processes upstream of the finishing equipment, is called levelling. You often find other processes, such as cleaning, trimming, coating or cut to length, combined with a levelling line. This is why the all-encompassing name of a ‘finishing line’ is given to many of these processes. How do we measure off-flatness? We usually define the level of off-flatness in one of two ways. The first uses a parameter called the I-unit. An I-unit is equivalent to 10 micro-strain and reflects the length differences within sections of the strip over the width. A second method is to specify off-flatness buckle height (amplitude) and the frequency of occurrence (wavelength). There are various offline measurement methods available, one of which uses scanning technology. In this case, a scanning unit measures the height and frequency of waves or buckles across the width of a metal sheet sample. A less sophisticated approach is the metal wedge technique. This is where an operator places a ruled wedge of metal underneath the sheet sample to check for buckle height, and then uses a ruler to measure the distance between the waves or buckles. The customer, if not checking these parameters directly, may get the best feel for the flatness of the product from visual observation when it is on the production line. Deciding which type of levelling line to use depends upon the types of products, their thickness ranges and the alloys involved. For example, a cut-to-length line processing hard alloys at thicker gauge will most commonly incorporate an alligator leveller. A surface critical product will likely use a stretch levelling line. Whereas a soft alloy, coil-to-coil process will typically use a roller/tension leveller. To confuse things further, there may be ‘flatteners’ at the start of a production line directly after the decoiler. These contain a series of rolls touching both the top and bottom surfaces of the strip. Flatteners reduce coil set and help with the threading of the line in products with a gauge above about 0.3 mm. There are a several types of levelling line and each seems to have its own collection of names. Therefore, in this blog, I’ll use diagrams where possible. Let’s now have a look at three types of levelling line in a little more detail. 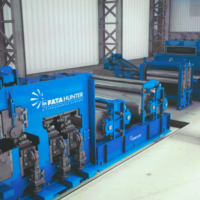 These machines use entry bridle rolls to build tension and then the levelling (roller) section bends the strip over a series of small diameter rolls. Therefore, stretching of the material occurs as a combination of line tension and bending the strip over rolls. Finally, the exit bridle rolls decrease the tension. Alligator levellers consist of two banks of rolls, one of which is parallel to the pass-line. The second bank can be adjusted in height and by incline. You often see these in cut-to-length lines. However, when handling thicker strip, they require support rolls to prevent the work rolls from deflecting. Stretch levellers increase the tension in the strip to exceed the yield stress. Adjusting the peak tensions achieves the necessary elongation. 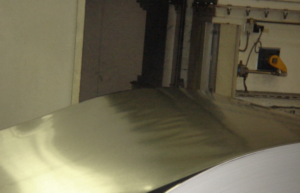 Sheet producers mainly use stretch levelling for surface critical products as this reduces the number of non-covered rolls in contact with the strip. Stretch levellers, or pure stretch lines (where tension alone achieves the elongation and plastic deformation of the material), tend to process products with gauges between 0.1 mm and 0.5 mm. Pure stretch lines can have very strict requirements. In terms of cleanliness, the aluminium strip must be completely free from rolling oil. This ensures there is no slip when it is within the high tension levelling section. Slip may cause ineffective stretch, marking on the strip and, in some cases, strip breaks. Furthermore, the temperature must be uniform across the width of the strip prior to stretching. Finally, good quality incoming material is essential. Due to the higher tension required within pure stretch lines, coils with defects such as holes or surface damage are particularly susceptible to strip breaks. Coils that have varying levels of off-flatness upon entry into a stretch line can also cause problems. Some commercial systems use a feedback measurement system which alters the levelling settings as the coil is being processed. Most of these systems are controlled by operator intervention. In these cases, the operator analyses a sample offline and adjusts the flatness settings based on the previous coil’s settings. However, if the incoming off-flatness of a coil is significantly different to the previous coil, the adjustments could end up introducing off-flatness, rather than correcting it. The Process Improvement team at Innoval has lots of experience with levelling and its challenges. Whether you’re thinking of investing in a new levelling line, in the process of setting up a levelling line or optimising your current process, we can help you. We have a variety of process models, including a tension levelling model and a winding model too. Finally, did you know we have a finishing training course that we can deliver at your site? For more information on any of these, please drop us a line. Rachel is part of Innoval’s Process Improvement team. She works with our clients to get the most out of their rolling and finishing operations.